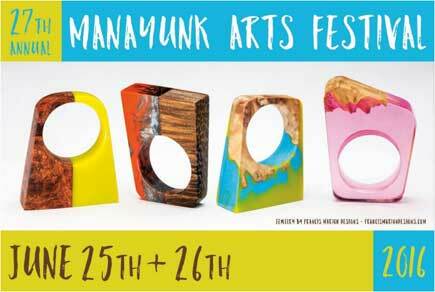 This year marks Ryefield Ceramics‘ 8th visit in 10 years to the Manayunk Festival of the Arts. The festival is in its 27th year and remains one of the largest out door festival in the Delaware Valley. The festival runs from 10 AM to 7 PM on Saturday, June 25, 2016 and on Sunday, June 26, 2016 from 10 AM to 6 PM. We will be in booth 216, more or less the same location we’ve been at for the last few years, closer to east end of Main Street. The event is rain or shine, free and open to the public. Manayunk, is a neighborhood in the northwestern section of Philadelphia, Pennsylvania known for its arts scene and steep hills. 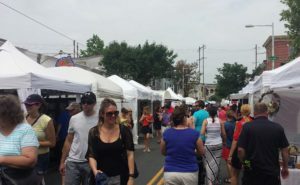 The Manayunk Festival of the Arts perennially draws close to 200,000 people to Main St. Manayunk over the festival weekend. Close to 300 artists come from all over the country and the show stretches for about a mile and a half from Green Street to Shurs Lane. Many of the local restaurants and taverns have outside seating available and there is always a large food truck court in right in the middle. Plan to spend a lovely day right in a historic town along the Schuylkill River. Public transportation is readily available and pretty easy to do. SEPTA’s Manayunk/Norristown Line drops guests off at the Manayunk stop which is mere blocks from the hub of the festival. SEPTA buses 35 and 61 leave riders only steps away from the artists. If you do drive, the festival will be running shuttle buses from two different parking lots. You can pick up the shuttles at 555 City Avenue or at the Ivy Ridge Train Station on Umbria Street and for a $4 round trip donation (kids ride for $2) to North Light Community Center you can be dropped off right at the entrance to the festival! Parking lots are available in both of those locations. The City Avenue shuttle will also make a stop at the corner of Shurs Lane and Ridge Avenue and the Ivy Ridge shuttle will also stop at Gorgas Park (Hermitage Street and Domino Lane). Shuttles run from 11AM-8PM on Saturday and 11AM-7PM on Sunday. Parking is also available on the street, check the signs. 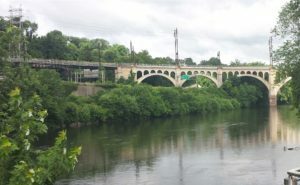 The Schuylkill River is quite picturesque and easy to walk, run or bike along and biking to the Manayunk Arts Festival is also an option. 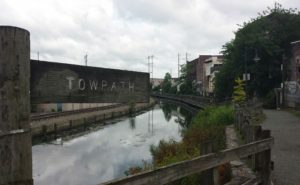 Take Kelly Drive from Center City or the Schuylkill River Trail from all parts of the Philadelphia region. Visit the Bike Coalition of Greater Philadelphia for more details and biking maps.